This post was originally published on October 14, 2016. SO many people love this easy DIY Christmas craft! 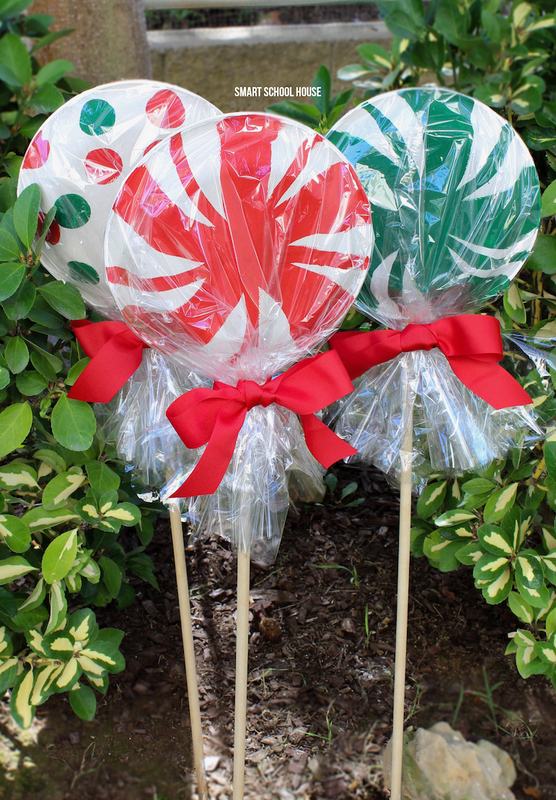 These are giant paper plate lollipops for Christmas. They are super cute as a garden decoration or you can line your driveway with them. Plus, they cost less than a dollar each to make! They do not have to be painted perfectly because the cellophane makes them all look ADORABLE no matter what your skill level is which makes it an easy DIY craft anybody this holiday season. Let’s get started making giant paper plate lollipops! 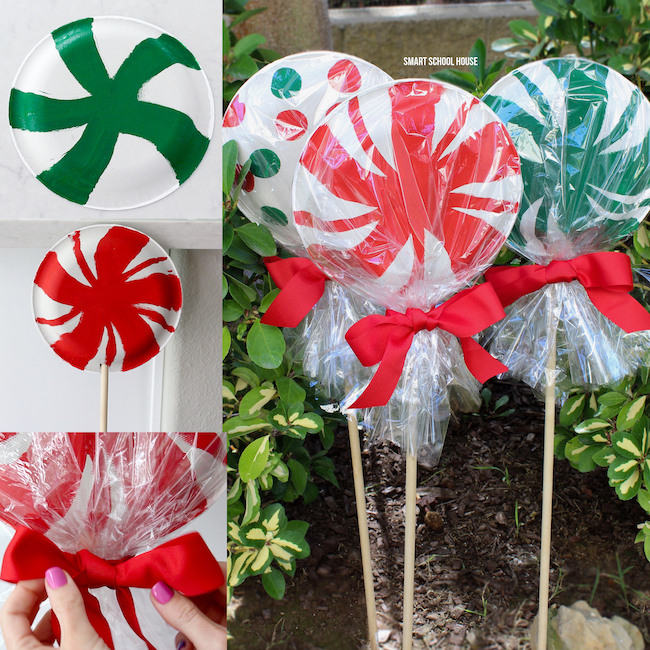 We had so much fun making these giant lollipops from paper plates. Candies that don’t give you cavities? Perfect! With just a few supplies kids can create the coolest christmas decor! Put them in your yard or display them in a vase filled with peppermint candies. Whatever your presentation the kids will so much fun making them! So easy! Decorate your garden with them this Christmas or line them up along your driveway. They cost less than a dollar each to make! If you get paper plates from Costco (like we do), then they’re even cheaper! I used acrylic paint, but use whatever you have or washable paint if kids are doing it. I got the sponge “dot” paint brushes at the craft store. You know what wold be fun? Making them in different colors for candy themed parties! Merry Christmas and happy DIY decorating! 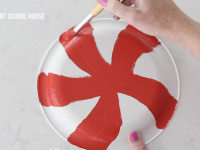 Paint various lollipop designs on the back of 2 paper plates (or one paper plate if the back of the lollipops will be hidden wherever you display them). Cut two small squares out of each paper plate as seen in the video. Glue the paper plates together, making a hole for the dowel to be inserted. Once dry, insert the wooden dowel. Wrap cellophane around the paper plates and tie a ribbon around them (this keeps them attached to the dowel). And sometimes you can find them at the dollar store! You could probably also use garden stakes. 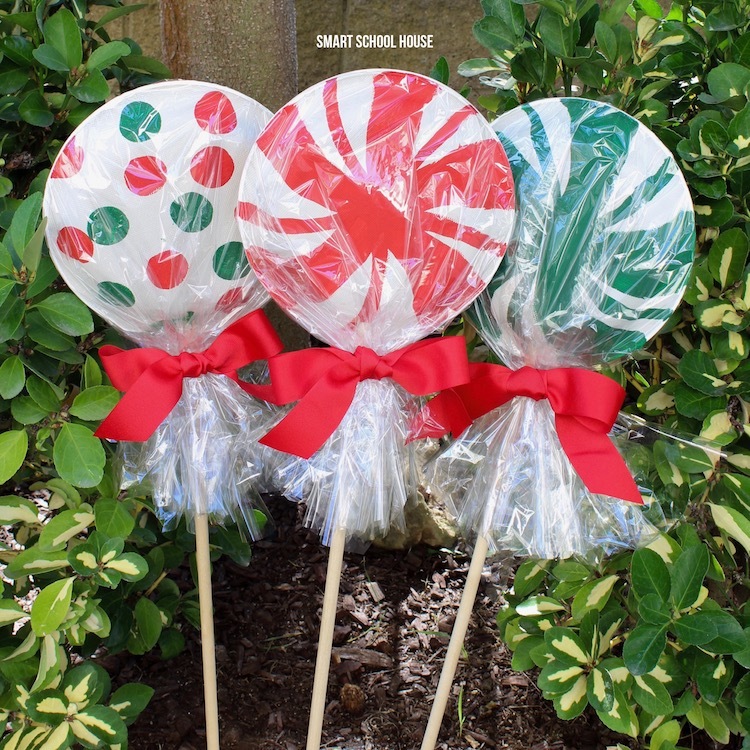 I really love these lollypops I am going to make them at Christmas time in all different colors. Thank you! I just made these! I used 10 inch paper plates. And after I painted them and let them dry, I sprayed them with clear glitter spray. I also bought the plastic bags at Michaels and use the 40% off coupon it was size small and I got 16 bags and it was a better value than buying bags or cellophane wrap at Dollar Tree. I used 5 & a half inch bows and I got 2 bows for a dollar at Dollar Tree. This is the best website. Love It!!! I’m so excited to make these! I bought everything today to make 6 of them! Thanks for sharing this project! I made the lollipops today. Adorable ,easy,fun.i put them into planters out front. I added Rick’s wrapped in colored cellophane to hide the base. How can you keep these from being ruined when it rains! Thank you for this craft.